Marking yet another upsetting turn of events at the hands of the Trump administration, it was announced yesterday that the United States government canceled the proposed limits on the number of endangered whales, dolphins and sea turtles that can be injured or killed by gillnets on the West Coast. 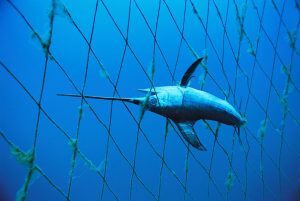 The now defunct rule, which would have applied to less than 20 fishing vessels that use the monstrous fishing nets to catch swordfish in California and Oregon, would have halted gillnet fishing for up to two seasons if excess numbers of the nine groups of whales, sea turtles and or dolphins were trapped by the inconspicuous but dangerous net. The measure which was originally introduced by the Pacific Fishery Management Council in 2015 would have applied to the endangered fin, humpback, and sperm whales, short-in pilot whales, and common bottlenose dolphins, as well as endangered leatherback turtles, loggerhead turtles, olive-ridley sea turtles and endangered green sea turtles. Yet now, per Michael Milstein, a spokesperson for the National Oceanic and Atmospheric Administration (NOAA), the division has determined that the economic ramifications would have “a much more substantial impact on the fleet” than they had originally realized. Further, he claimed, safety measures already enacted by the fishing industry, such as using pinging warning devices on the nets, have worked to “drastically” reduce the numbers of entangled whales and sea turtles. “The Trump administration has declared war on whales, dolphins, and turtles off the coast of California,” noted Todd Steiner, director of the Turtle Island Restoration Network, which is based in Northern California. “any accidental harm to endangered communities of humpback whales and leatherback turtles would be particularly dangerous given their low numbers; as low as 411 for one group of humpbacks. While NOAA figures reportedly estimate that the number of vessels plunged from a high of 129 in 1994 to 20 in 2016, many disagree. Sadly, the devastating news comes not even a full week after WAN reported on the positive new alliance between the Leonardo DiCaprio Foundation, the Government of Mexico, and the Carlos Slim Foundation, to support efforts to save the critically endangered vaquita porpoise. Featured image is from takepart.com.